Saturday afternoon, I joined some friends at Parc André-Citroën to do something I’d never done before: ride in a balloon! That’s right. Perhaps surprisingly, this almost 40-year-old had never, ever gotten inside the basket of a hot air-balloon to make an ascent. It’s not that I’m afraid of heights. (I have, after all, been to the top of the Eiffel Tower, the Empire State Building, and the Sears Tower in Chicago. I’ve even gone parasailing.) It’s just that, for whatever reason, I had never gotten around to doing this before yesterday. I was invited by a friend who was doing field research for a presentation on Parc André-Citroën. This 59-acre park was constructed on the site of the 1915 Citroën factory, where André Citroën built one of the first fleets of French automobiles. That factory closed in the 1970s, and the city of Paris purchased the property and opened the park in 1992. The park features an expansive central lawn around which are situated two greenhouse pavilions, “dancing fountains” where kids (and adults) can play in the spray of the jets during the summer, a reflecting pool traversed by a suspended walkway, and six ornamental gardens. 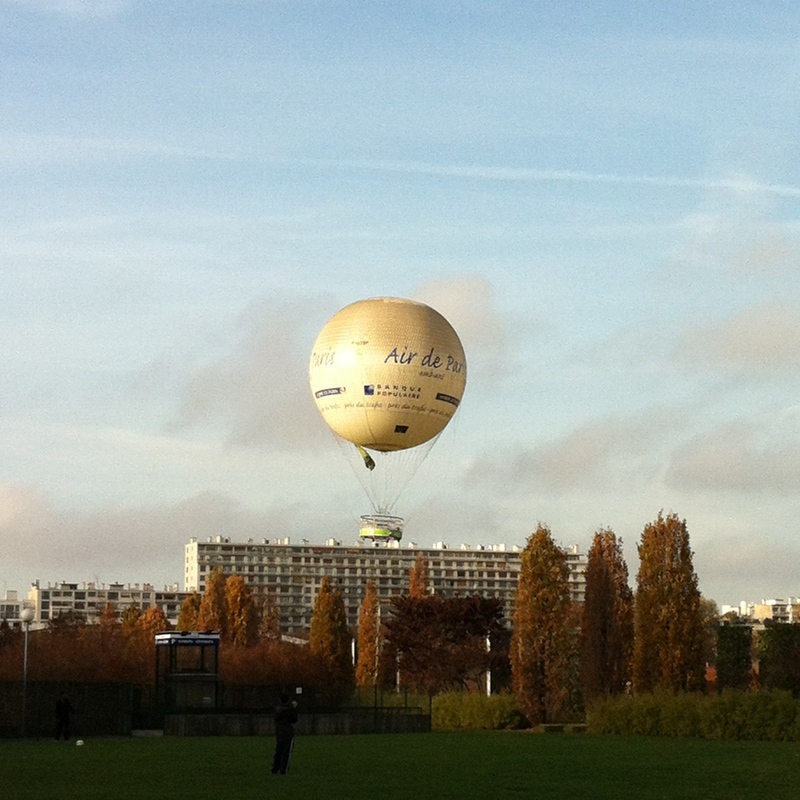 But what drew me to Parc André-Citroën yesterday (in addition to catching up with friends, of course) was the opportunity to take a ride in the Ballon Air de Paris. to watch this. The wind gets quite loud. Now, because you all know that I’m a big history nerd, I must interject that it was quite appropriate that my first balloon ride was in Paris. After all, France is the birthplace of both hot-air and gas ballooning … and 1783 was the year for it. That year was marked by a technological race between two teams of scientists and engineers to achieve the first flight by mankind, and it caused a real sensation. One team, headed by Professor Jacques Charles and the engineering brothers Anne-Jean and Nicolas-Louis Robert sought to achieve the dream by using hydrogen-filled balloons; the other team, headed by the engineering brothers Joseph-Michel and Jacques-Étienne Montgolfier, sought to achieve it with hot-air balloons. During the summer and fall of that year, both teams succeeded in testing unmanned flights of their balloons—the Montgolfiers demonstrating one flight to the royal court at Versailles, using animal passengers including a sheep named Montauciel (“Climb-to-the-sky”) and a duck and a rooster (whose names, if they had any, are lost to history). The Robert brothers finally succeeded in achieving a manned flight on December 1, but the Montgolfiers had already beaten them to it … and by only 10 days. The Montgolfiers had already tested manned ascents up to a tethered altitude of 80 feet in October, and on November 21, they achieved the first free, untethered flight by human beings. Lifting off from the grounds of Château de la Muette (not far, in fact, from today’s Parc André-Citroën), the flight traveled for about 5.5 miles over Paris, reaching an altitude of about 3,000 feet, and touching down amid the windmills on the Butte-aux-Cailles just outside the city walls. Frankly, Mr. President, I’m glad they kept us tethered to the earth yesterday. It was impressive enough as it was! A ride on the Ballon Air de Paris costs 12 € on weekends and holidays (10 € on weekdays). That may seem a bit steep, but I thought the exhilaration of that 15-minute float upon a “limitless plane of air” was well worth it. For more information, you can visit Ballon Air de Paris’s website here (in French).